It’s less than four weeks out from this year’s NACS Show in Las Vegas and we at iSEE couldn’t be more excited. Supporting NACS and all they do for the industry is a key tenant of iSEE. In fact, we are proud to have three team members serving on NACS boards and committees: CEO Joe Vonder Haar (Joe V) is currently on the NACS Supplier Board, vice president John Thomas (aka JT) is on the Supplier Membership & Communications Committee and marketing director Melissa Vonder Haar is on the Convention Content Committee. 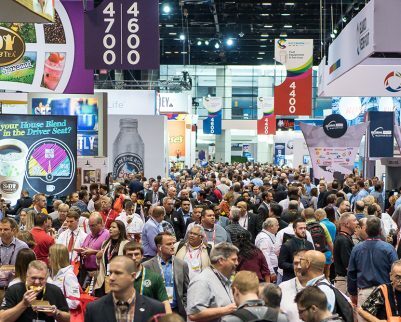 Here are pointers from our committee members on making the most of your NACS Show experience off the trade show floor (don’t worry, we’ll have a whole blog post dedicated to making the most of the show floor!). Embrace the Family: JT cites the three pillars of NACS: knowledge, connections and advocacy. “New retail and supplier members can benefit from these connections,” he says. “Believe it or not it is a small world. NACS is like a family.” (More information on NACS membership can be found here. Enjoy the Benefits: New NACS members are given the opportunity to network with other new attendees at the invitation-only New Member Reception. This reception goes from 5:00-7:00pm on Sunday October 7th. Get Involved: The NACS Show is a great opportunity to benefit from the associations’ advocacy efforts, whether it’s from education and general sessions, the NACSPAC Lounge or more. “NACS can help keep us informed about the various legislative activities that can impact all of our business and advocates to keep our voice heard both at a state and national level,” JT says. Be Prepared for Success: In terms of broader networking, Joe V encourages attendees to have their “elevator speech” prepared, as you never know when the opportunity will arise. “The casual conversation where you demonstrate how your story is a relevant fit for the industry can lead to bigger and better discussions,” he says. Choose Networking Events Wisely: Joe V notes that the various after-show events and parties are fun, but often prohibitive for a sales pitch, due to the entertainment and/or attendees’ desire to kick back and unwind. Instead, he suggests savvy folks look for alternative options that offer a better environment for productive networking opportunities. “One that can be overlooked is taking time to volunteer as an Ambassador,” he says, adding that the Ambassador program only takes an hour of your time. “Suppliers can get caught in the act of doing something good for the industry! The retailers know that you are volunteering and giving freely of very precious time. What better conversation starter could there be?” More information on the NACS Ambassador program can be found here. Plan Ahead: “We all know that things can get a little bit crazed once the show starts,” Melissa advises. “While it’s certainly possible to decide in the moment what Ed Sessions might fit for you, it’s always easier if you’ve familiarized yourself with the options beforehand.” The schedule of education sessions can be found here or by downloading the NACS Show app for easy access on-the-go. Reserve Your Spot: Nothing worse than getting excited about a session only to get there and realize it’s full. You can register for educational sessions as part of your NACS Show attendee registration to guarantee a spot in your must-see sessions. Think Outside the Box: The education sessions are organized by both store count as well as tracks (category management, government relations, marketing, etc). But with so many great speakers and subjects, sometimes we learn the most from a session we’d never think would apply to our current job. “I always enjoy picking out at least one session that strays from the ‘what I should attend,’ whether it’s based on a particular speaker, topic or just something I’m excited to learn about,” says Melissa. “Last year, it was the ‘Applying Basket-Level Shopper Insights to Drive Sales’ session from SwiftIQ. It didn’t necessarily apply to my day-to-day job, but I left the session enthused and full of insights on how retailers have successfully leveraged data to plan their sets.” The full list of NACS Show speakers–which includes Joe and Melissa–can be found here. iSEE Hires Operations Specialist: Welcome Aleah! NACS Cool New Products: Where Are They Now?